The following information applies to all collections of waste materials provided by the city for weekday pickup only. The sectors and dates of the various collections indicated in the annual municipal calendar are also available online. Find your residential sector click here. Find the collection dates for each month and by sector click here. EVERY SECOND WEEK between 7:00 am and 6:00 pm. 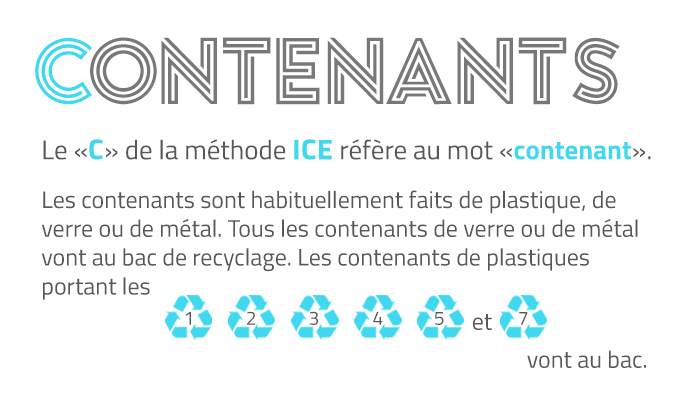 By putting materials that can be recycled into the recycling bin, you’re playing an important role in preserving the environment and in contributing to sustainable development in the City of Deux-Montagnes. The first “P” in PCP stands for PRINT. 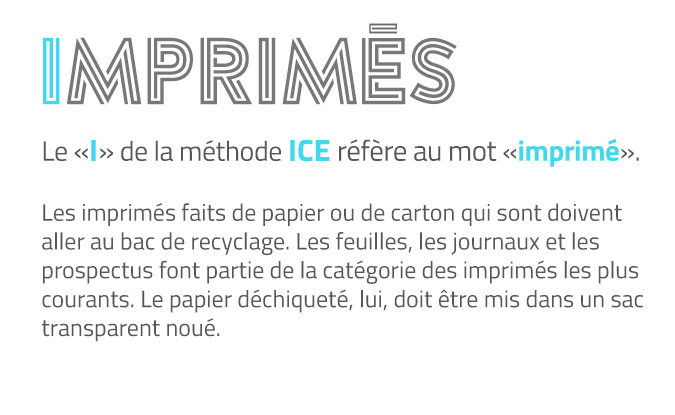 Printed matter on paper or cardboard must be put into the recycling bin. Flyers, newspapers, and catalogues are among the most common types of printed matter. Shredded paper must be put into a transparent bag with tie. The “C” in PCP stands for CONTAINERS. also go into the bin. The second “P” in PCP stands for PACKAGING. Packaging is usually made of plastic or cardboard. 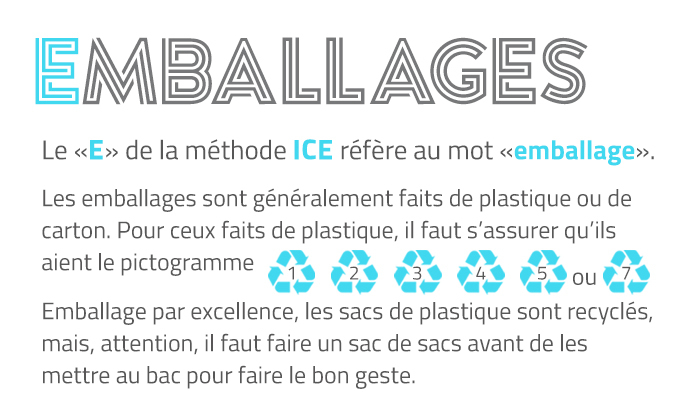 For plastic packaging, make sure it has the 1 2 3 4 5 6 or 7 symbol on it before putting into the recycling bin. Plastic bags – the most popular packaging of all – can be recycled. Just make sure to put all bags into one separate bag before recycling. PUT YOUR RECYCLING BIN ON THE STREET…click below. between 7:00 am and 6:00 pm. The brown bin comes with a starter kit. Both were delivered to all Deux-Montagnes residential addresses in early April 2019. Collections of fall leaf bags are scheduled between 7:00 am and 6:00 pm. Collections are scheduled on predetermined dates throughout the year. Consult the annual municipal calendar for the months of October and November. A single Christmas tree collection is scheduled for all residential areas between 7:00 am and 6:00 pm. Christmas trees are generally collected during thesecond week of January. For the exact date, please consult the annual municipal calendar on the Deux-Montagne homepage. Third Thursday of the month in all residential sectors between 7:00 am and 6:00 pm. An extra collection is planned during the first week of July after the moving period. For the exact date, please consult the annual municipal calendar on the Deux-Montagne homepage. PLEASE NOTE:Renovation materials and demolition debris are not considered as bulky waste but rather as dry materials that must be disposed of in a special way. Please consult the note on the disposing of dry materials or call the public works department at 450-473-4688. Deux-Montagnes provides a pickup service for tree and shrub branches on your property during weekdays for a fixed fee. Please group branches together and tie them up in a way that makes it easier to collect them. Collection fees must be paid before the day of collection. There is no charge if you bring your own branches to the city’s depot. On the first Saturday of the month, from April to the end November, residents can bring their hazardous household waste to the municipal garage depot at 625 20e Avenue in Deux-Montagnes between 9:00 am and 3:00 pm. To find out what hazardous household waste products are accepted at the depot, please call the municipal garage at 450-473-4688. Deux-Montagnes residents can bring dry materials and debris from renovation work to the city’s depot during weekdays. The depot is open Monday to Thursday from 8:00 am to 11:30 am and from 1:00 pm to 4:30 pm, and on Friday from 8:00 am to 11:30 am. Fees are applicable once your dry materials and debris have been unloaded. For current rates based on volume, please contact the municipal garage in advance at 450-473-4688. Deux-Montagnes has set up recycling bins where residents can deposit their used batteries from every size and type of household electronic device on weekdays and weekends. 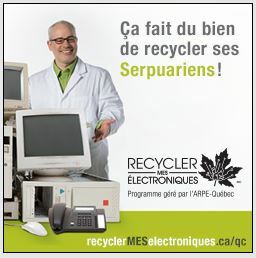 Deux-Montagnes residents can drop off their used electronic devices at the municipal garage on the first Saturday of the month from April to November. For the list of devices accepted at the depot, please contact the municipal garage at 450-473-4688 before you head out the door. DO YOU HAVE QUESTIONS OR COMMENTSON COLLECTIONS AND DEPOTS? Contact the public works department in the municipal garage at 625 20e Avenue or call 450-473-4688. Write to us from the Deux-Montagnes Facebook page or from the Comments and Requests tab on the city’s homepage.